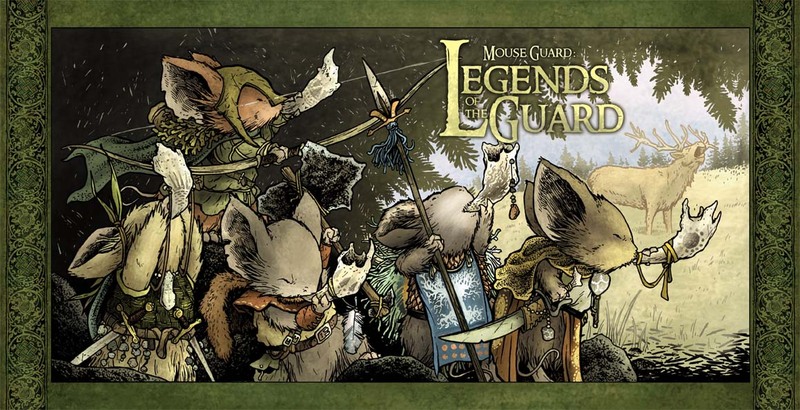 Video Blog:Trying something new with a video post about the models I make for Mouse Guard. The video is about 13 min long. Enjoy! 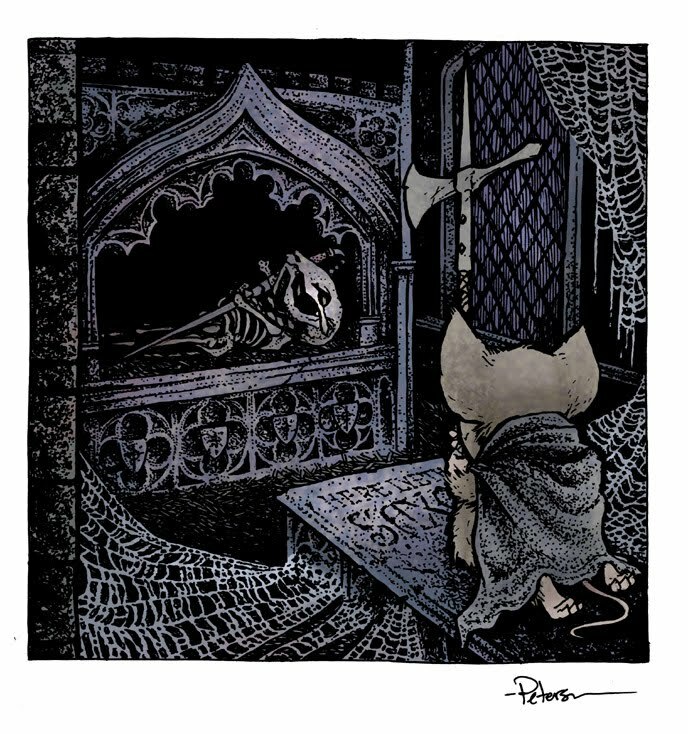 Induction: Back in 2006 I did a piece similar to this one and mentioned that I'd like to revisit it. 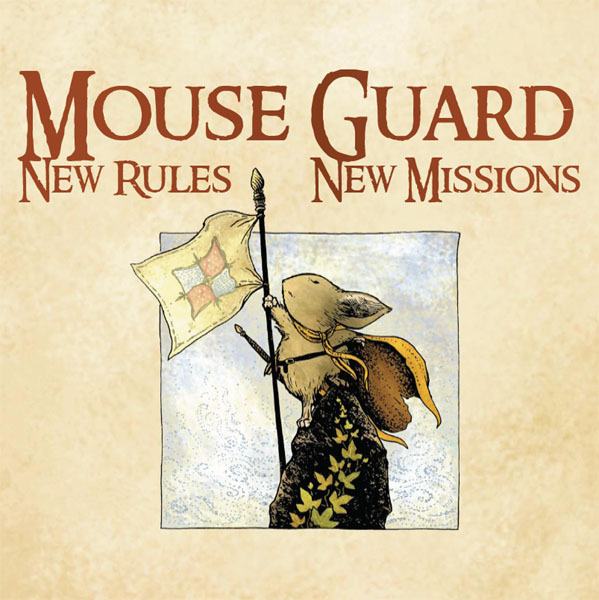 Working on the RPG with Luke Crane helped me to establish how I wanted to handle a mouse becoming a Guard, what were the requirements, and then once you were accepted, what was the ceremony like. 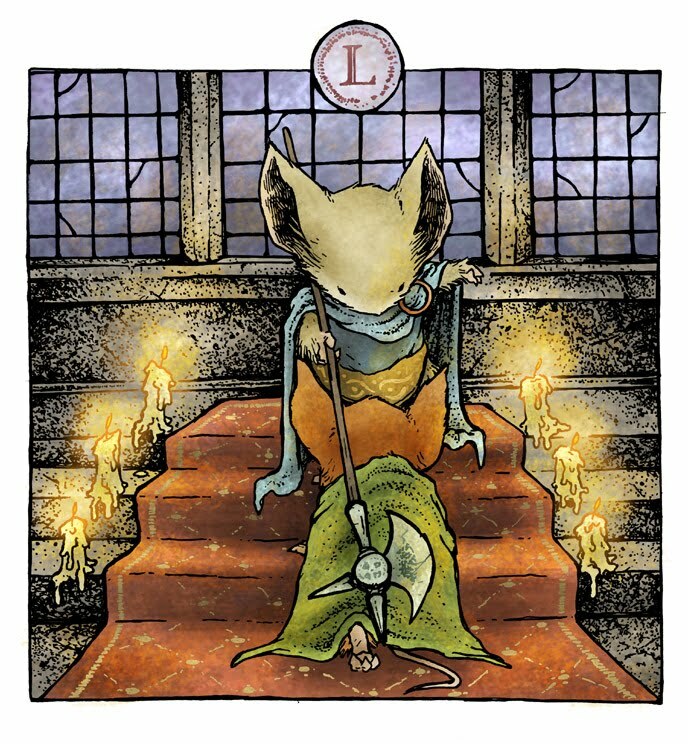 I don't know if I drew this or the title header for the RPG that shows a similar scene first, but my influences were: being inducted into the National Honors Society in high school, The Sorting at Hogwarts, the Metal Ceremony from A New Hope. Now I still haven't shown this scene in the comics, but I do plan on giving the readers a front row seat to an induction into the Guard. 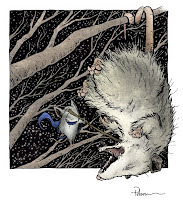 Weasels: Black Axe will have Fishers & Ferrets...but they do not offer the promise I have made since day one of a massive battle between mice and weasels. 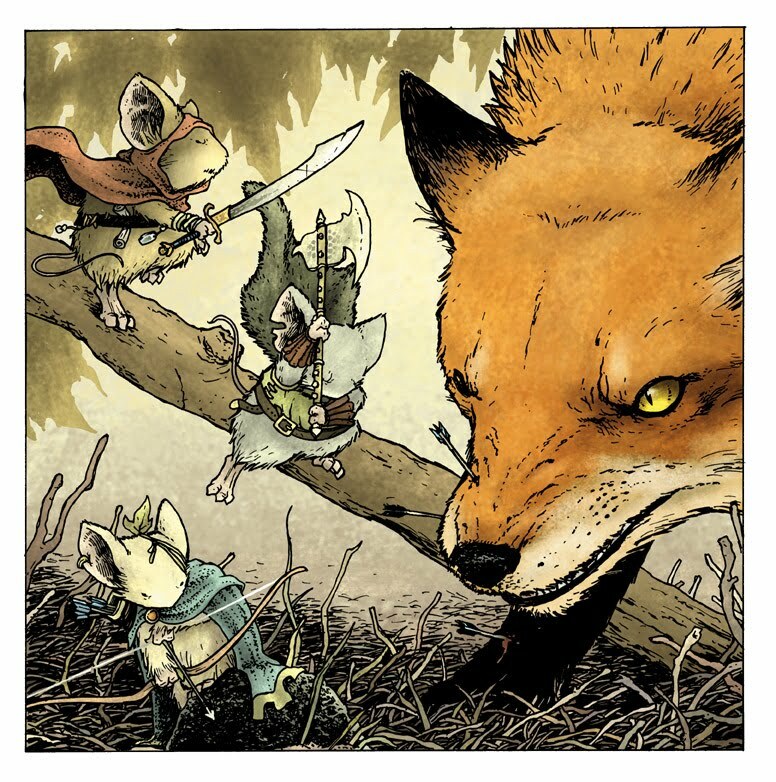 The plan is for that to be the fourth book in the Mouse Guard series set in 1149. I have to admit, the idea of drawing that war has me a bit worried..it's a tough job doing a normal series, but a whole war!?!? yikes. 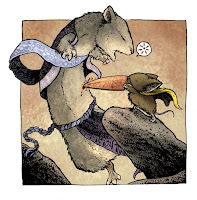 So the pieces I have done with mice fighting weasels have been good practice. This one was from a fan requesting Rand doing some damage. Fitting since Rand will be a main character in that story. 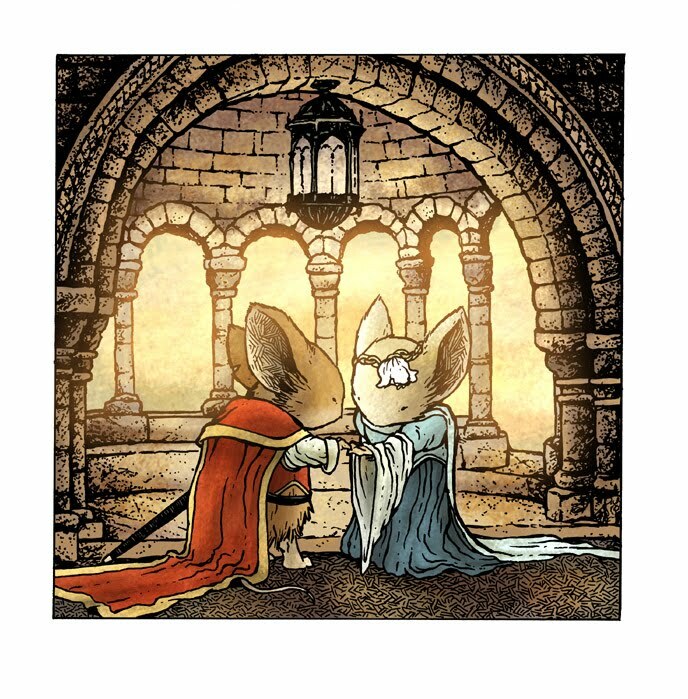 Love: I like a good love story, and I wanted to bring some romance to Mouse Guard. The ball got rolling with Winter with two couples romances starting, but in one case, it was under such adverse conditions, it wasn't very romantic, and the other happened at the end of the book. I have plans to deal with those characters and their feelings for each other in stories down the road. This piece (the original of which hangs to the left of my studio desk) reminds me to make sure the stories are about characters and relationships as much as it is big vs little and high adventure. Loukas: Saxon's mentor was a character who was supposed to just be a mentioned mouse in the 4th issue of Winter. However since I needed to show a flashback and have Saxon inherit items of his, I had to design his cloak and sword, etc. The idea of Loukas and what his relationship to Saxon was like grabbed me. I have a history for the character planned out and I suspect we will see more of him in the Winter War of 1149 as well as a yet-untitled-yet-unscheduled story involving Saxon and Kenzie when they first joined the Guard. 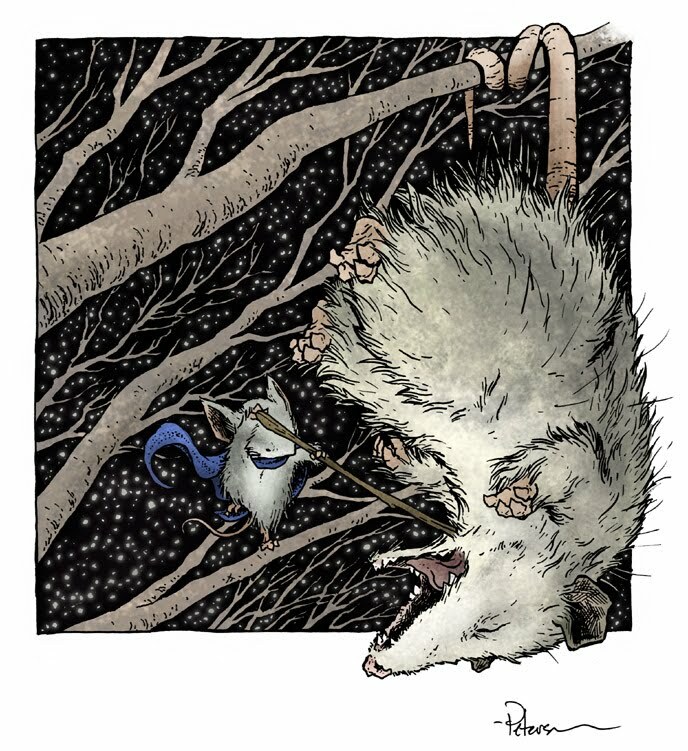 Opossum: This piece was drawn for a fan who asked for a Guardmouse attacking something. Sometimes it's fun to not just re-tread some of the old battles for these commissions (crabs, owl, snake, etc.) but to expand the world a bit. I also wanted to show Kenzie fighting something effectively. Because of his personality and choice of weapon, I think it's easy to pigeon hole him into not being an effective fighter. So pieces like this help me figure out ways to show Kenzie in another light. The End: While I have no end for Mouse Guard in sight. I do have ideas as to when certain characters meet their end. 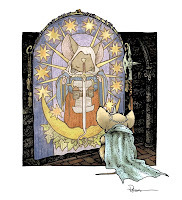 And that's not to say that it is anytime soon, but expecting a character to live forever is a boring prospect to me for the mice. I plan to use characters deaths to trigger events and force living characters to deal with the effects, even if those effects are only their own grief and loss. 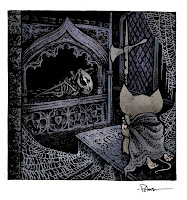 This commission started when I was asked for 'something creepy...like a tomb' and became a scene I have planned a long way off, but is an iconic moment for me in the continuation of Mouse Guard. A brand-new 44-page supplement* with new missions and adventures. Luke and I had said from the start that we didn't want to expand the game and make supplements unless we had very good reason to. So in the booklet we cover a few new rules including riding mounts, 'weapons' for conflicts, & three new locations: Flintrust, Grasslake, and Sandmason. 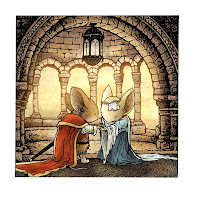 The pre-made characters from the main RPG book have been advanced, Celanawe has been added to Kenzie's patrol, and an entire new patrol of characters from the Mouse Guard comics has been made into template characters. With all of that AND three new missions, we feel like this was a supplement worth making. Dice: In the Mouse Guard RPG, the dice rolls are almost binary: failure( 1-3) and success (4-6) ...with 6 being noted as a 'bonus' success that you can re-roll to gain even more successes. 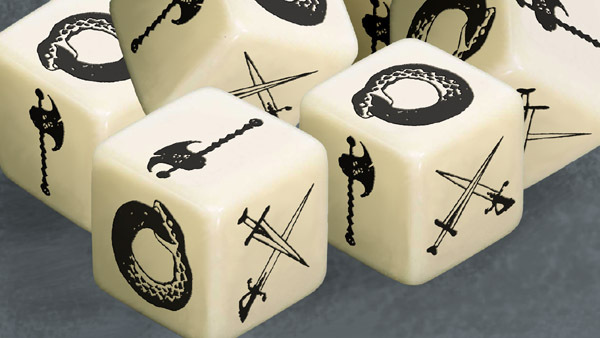 So we designed special dice that are included in this set(x10). The failures are represented by a snake eating it's own tail, the successes are crossed swords, and the '6' is replaced by the Black Axe. The image shown here is a photoshop mockup I made, so the final product may vary slightly from what is pictured. Cards: Three decks of 12 Action Cards each, 15 Condition Cards, & 21 Weapon Cards. 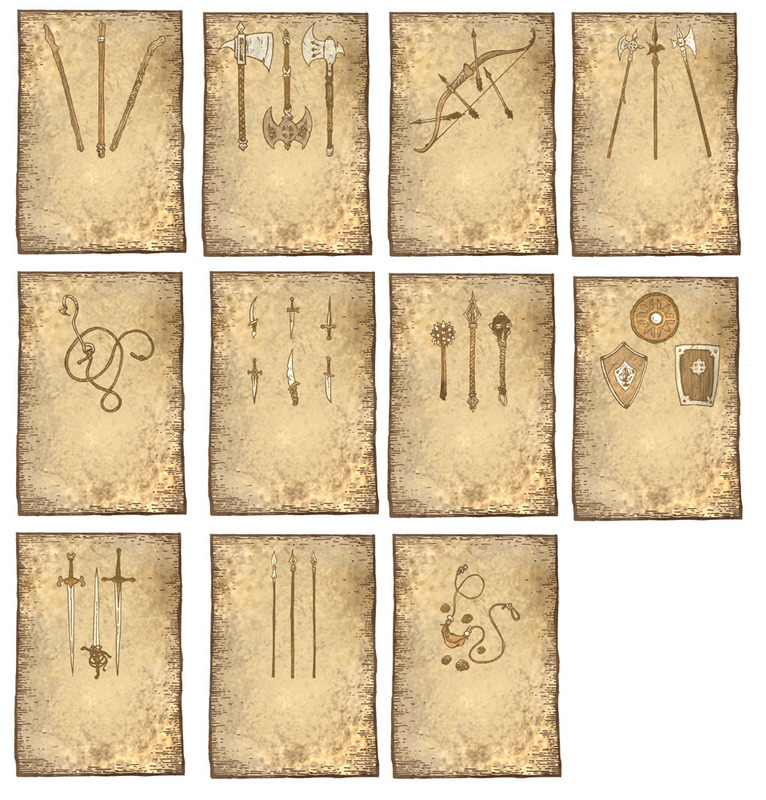 All of the cards are designed to help players streamline play. 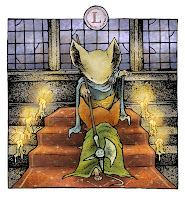 Instead of having to re-reference the book, or pass it among the players every turn, players can refer to their cards of options with rules noted on each. Playing them also saves writing and erasing over and over on your character sheet and/or scrap paper. 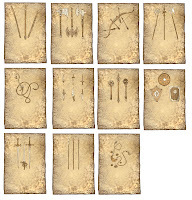 The weapons cards (of which I did new artwork for..though the cards shown are not the final design of the card layout, but rather to show the artwork) help players understand the rules for their weapons. Mace was also added with special rules for the boxed set. 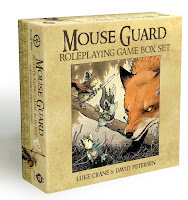 *The plan is to release the supplement booklet as a .pdf purchase so that players who already have the original RPG hardcover are not forced to buy the boxed set in order to take advantage of the new rules. 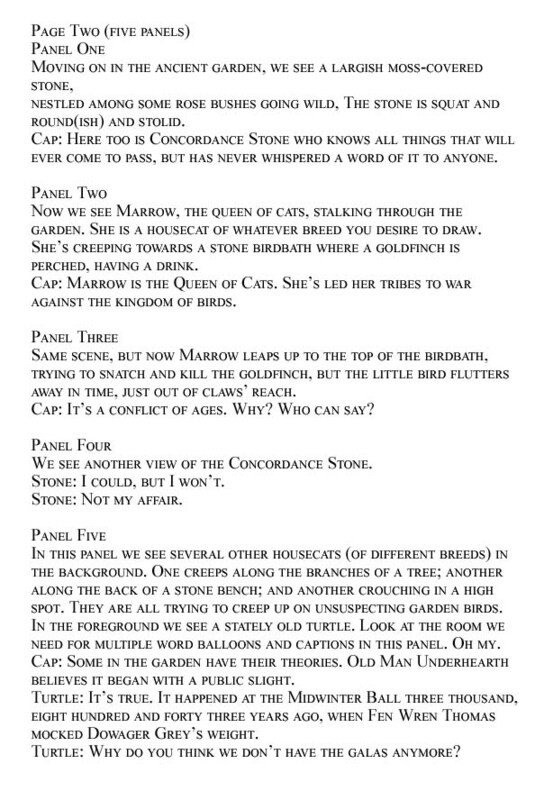 When I was asked to do a House Of Mystery story to be written by Bill Willingham I jumped at the chance. Not only would I get to work with Bill and get some great exposure, but I was looking forward to working from someone's script...something I had never really done much of. I was very lucky, in that Bill wrote the script for me, so the setting and subject matter already fell into my normal range of work. To the right is the page 2 script he sent. Vertigo was keen to have me thumbnail the entire story in advance. 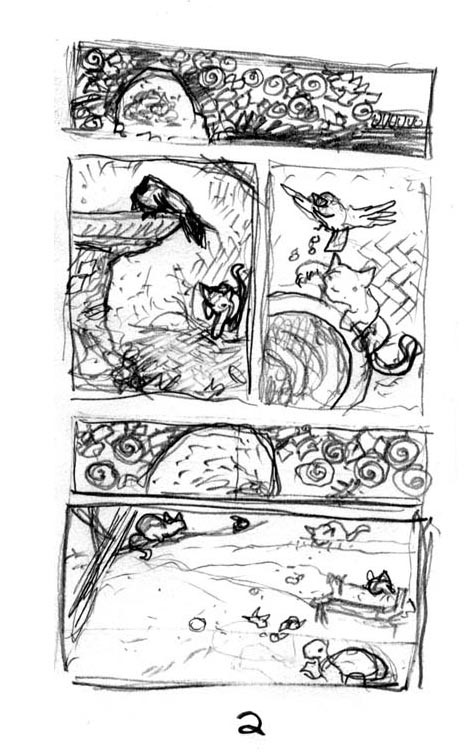 In this layout process, I didn't go into too much detail and, in fact, left the last panel a bit bare. With Bill's note about how many captions and balloons were going to be in that panel, I figured I would deal with filling in when working at full scale. The pencils shown here a a mix of parts I drew right on the page, and lightboxed sketches I had floating on various sheets of copy paper. 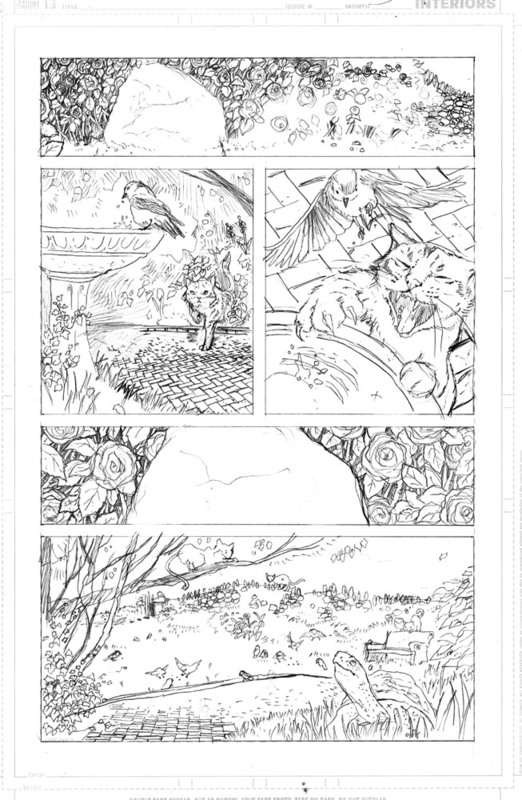 Knowing how I was going to handle the roses in panel 1, I felt that I didn't need to pencil the detail all the way across to give the editor a sense of what I was going for in the final inks. I cheated with the herringbone patterned brick work. I made a sheet of the pattern in photoshop and distorted it to different angles and printed them out, using a lightbox to transfer the pattern to the artwork. Once the pencils were approved, I moved on to the inks. 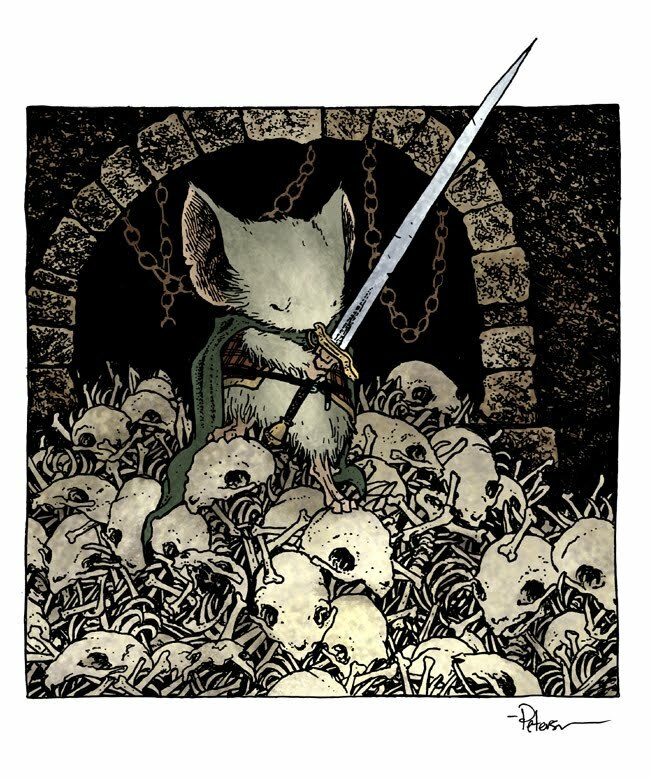 I penciled the page much tighter than I would a Mouse Guard page, so the inks were a very literal translation of what I had drawn already. 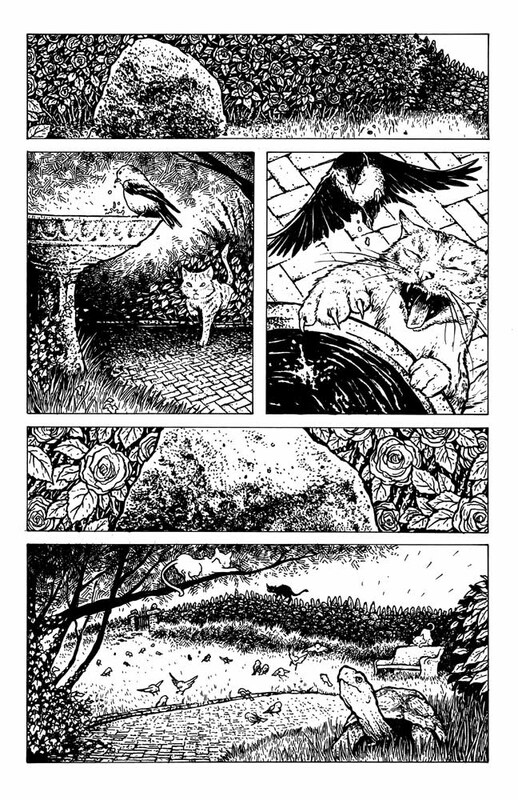 Areas with patterns were the places I did the most work directly in the ink, like the roses in panel 1, the foliage in panel 2, and the wall and plants in panel 5. For the colors I wanted to mute the palette but still give a sense of life and light to the garden. I tweaked the greens endlessly on this story, trying to make sure they didn't blend together and didn't have too high a contrast. Adding the color-holds to push the background further back helped me give the garden a slight dreamy state, which fit well with the tone of Bill's script. 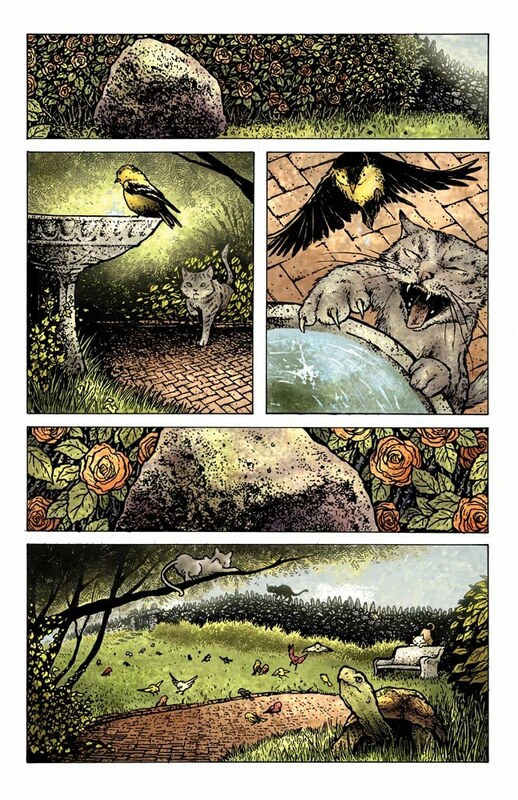 The final art appeared in House of Mystery number 7 and was reprinted in the TPB of House of Mystery vol.2.